Having your parking lot constructed and properly maintained by a professional construction company will increase the life expectancy of your pavement, considerably reducing your costs in the long run. Maintenance can vary between small amounts of surface work to large, time-consuming lot overhauls. There are several steps that must be taken in the construction of new pavement, and each step is vital to the life expectancy of any type of asphalt surface. On its own, asphalt can last years, but extreme weather, overweight vehicles and regular impact to the pavement can cause its life expectancy to decline considerably. All it takes is one crack to allow water to penetrate, causing significant damage. A properly maintained lot is inspected periodically to look for signs of damage and take remedial action. A damaged lot will create hazards and risks to occupants, and repairs cannot be indefinitely delayed. Follow the seven tips below to choose the right company for your paving needs every time. 1. Ensure the best quality results. 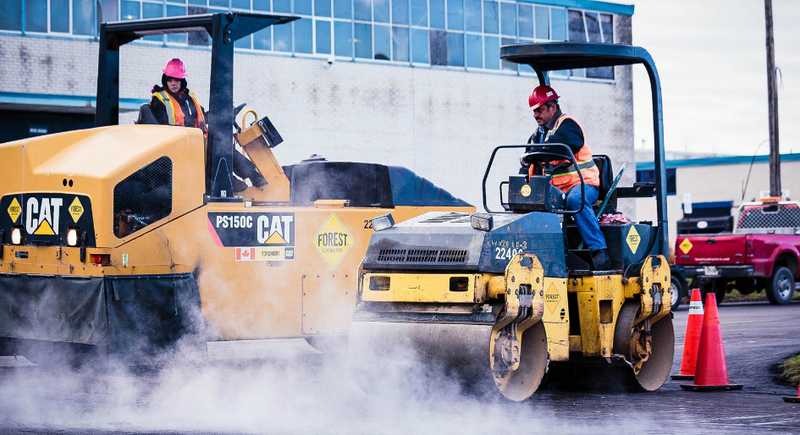 Forest Contractors, named one of Canada’s Best Managed Companies by Deloitte, has over 20 years of professional experience in asphalt repairs and new parking lot re-construction. Forest has been providing solutions to various large companies including several Fortune 500 companies for a number of years. Not only that, but the firm has the equipment and expertise required to use state of the art laser guided machinery and runs its own asphalt manufacturing facility, further guaranteeing quality. 2. Reuse the existing asphalt base, if possible. Parking lots and other paved areas can often show signs of aging while the asphalt base remains stable. When this happens, instead of overhauling the whole lot, resurfacing the asphalt will increase the life expectancy of the paved region and increase thickness and durability. Prior to resurfacing, Forest uses sophisticated machinery to grind out the damaged asphalt, and resurface with new asphalt at a significantly lower cost. Pavement is prone to cracks and potholes, and post-winter is when you may notice imperfections due to ice, snow, road salt and extreme weather. Cracks in asphalt can be both a disturbance and a hazard for those in transit. A contractor will use sealant, a flexible hot rubberized asphalt, to bond the crack walls to spot-correct damage. This material moves with the pavement as it shifts and changes. As seasons change and temperatures fluctuate, this substance expands and contracts with the ground, helping to prevent water intrusion and extending the life of the pavement. 3. Maintain catch basins and manholes. Any low area of an asphalt surface requires regular maintenance to ensure water can easily flow through it. Since catch basins are located in lower areas of paved surfaces, they need to be maintained regularly to prevent or correct erosion. Finding cracked or allocated asphalt at the surface of catch basins or manholes is one way to detect deterioration. Maintaining catch basins and manholes is important, as contractors widely believe that water is the most destructive element to pavement. It can leak into the base layers of pavement through cracks in the surface. Regular maintenance will prevent this from happening and extend the life of your paved surfaces. 4. Refresh painted lines and markings. An easy way to make your lot look fresh and clean is to repaint faded lines and markings. Not only are these crucial for safe driving and parking, but a fresh coat of paint does wonders in making your pavement look good as new. Choose a company that follows all municipal bylaws and uses high quality technology and products for a lasting finish. Sustainable technologies have been steadily growing in popularity, and for good reason: the Earth must be protected as best we can. Forest Group, for example, uses cutting-edge green technology to execute projects with maximum efficiency and precision while also ensuring minimal impact to the environment. “Innovation through creating value-added services and embracing new technology to drive productivity is a key part of our continued business success,” says Domenic Gurreri, president and founder of Forest Group. 6. Can help you immediately, even in an emergency. 7. A reputation of excellence. Customer service is the hallmark of Forest Group’s success. The company’s entire staff is trained in customer relations and they take pride in maintaining the brand as one of Canada’s Best Managed Companies. Forest’s recurring customer base is testimony to its reputation in the industry. Repaving a lot doesn’t have to be a stressful experience. Instead, turn to an experienced contractor that knows what they’re doing to get the job done painlessly. Repaving will not be a small investment for you, so why risk spending more down the road to correct past errors when you can get it right the first time? To learn more, please visit www.forestgroup.ca. I agree that repainting lines and markings on your parking lot pavement is a great way to freshen things up. It could greatly impact the safety of your parking lot to ensure that markings are visible. It also could increase the parking efficiency if parking spot lines are clearly marked. Good tip to reuse the original base. That’s an easy mistake that people can make. Thanks so much for sharing. Great tip on catch basins! Honestly, before reading this article I never knew about low areas in asphalt and water flow. My work is repaving the parking lot since I guess we’ve been having a problem with cracks and potholes. Thanks for teaching me a little bit about asphalt! I liked that you had mentioned that it can be very important to maintain the manholes in the area when replacing the asphalt to make sure that it isn’t deteriorating at all. The parking lot at my work hasn’t been cared for properly and it has a lot of damage to it, I’ve brought it to their attention that it ‘s a problem and they’ve brushed it off that they don’t have the time to do any of the necessary maintenance or repairs. In my opinion, they should start looking into hiring a professional to come maintain the parking lot to help everything go by a little smoother. It was really informative when you said that catch basins should be the first things that the owner maintains regularly and make sure that water is passing over it properly. That is the one thing that we failed to take care of properly and now the catch basins are actually cracked and have a lot of damage. I will call a professional to give the pavement some repairs, then I will see to it that we take good care of it. I didn’t know that you could reuse the base asphalt! That would save a lot of time and money. Do you have any more information on repainting the pavement markings after the resurfacing? Thanks! This article may provide you with a bit more information on the regulations on traffic-marking coatings, frequency, etc. : https://www.reminetwork.com/articles/line-paint-fades-faster-under-new-regs/. I hope that helps! I appreciate your statement that lower areas that are asphalted need to be regularly maintained so that water can flow through it without causing damages. The parking lot of the office is, in fact, in a lower area. It is somewhere like a basement after all. Because of this, I will follow your tips and have a professional maintain it is frequently as needed. Thanks. Our parking lot has a lot of cracks and holes after winter and my dad wanted it repaired. It was discussed here that when hiring professionals for parking lot repair, he should have a company that has an excellent reputation. Moreover, it’s advisable to hire professionals for quality parking lot repair. I like how you said to refresh the painted lines and markings on your asphalt. I am getting the parking lot of my cafe repaved. Thanks for the tips on repaving a parking lot.